Singapore's newest Downtown Line 2 (DTL2) will start to operate connecting Rochor and Bukit Panjang on 27 December this year, Transport Minister Lui Tuck Yew said. 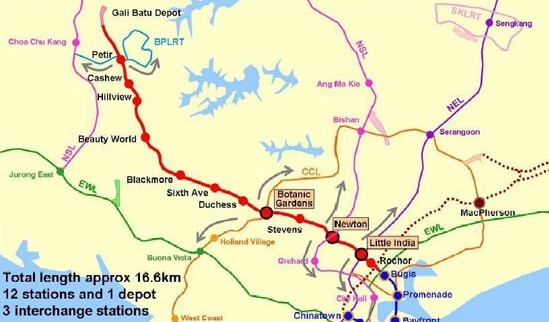 The 16.6 km Downtown Line 2 will open by the government along the course of 12 stations, which include Rochor, Stevens, Newton, Botanic Gardens, Little India, Tan Kah Kee, Beauty World, Sixth Avenue, King Albert Park, Cashew, Hillview and Bukit Panjang. Singapore train and bus fares are expected to be lessened by up to 1.9% starting Dec 27. According to Mr Lui Tuck Yew, fares would be revised with reference to the opening of DTL2. 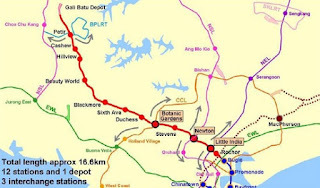 The new line is expected to improve connectivity for the commuters living at Victoria Park Villas and other commuters in the north-western region of Singapore, around 30% travel time will be save. Commuters will also have free rides of train on the entire Downtown Line 2 for a particular time only.